Do you fly over the city or Central Park? What is your policy on flying with children? Are helicopters a safe way to travel? How many people do your helicopters seat? 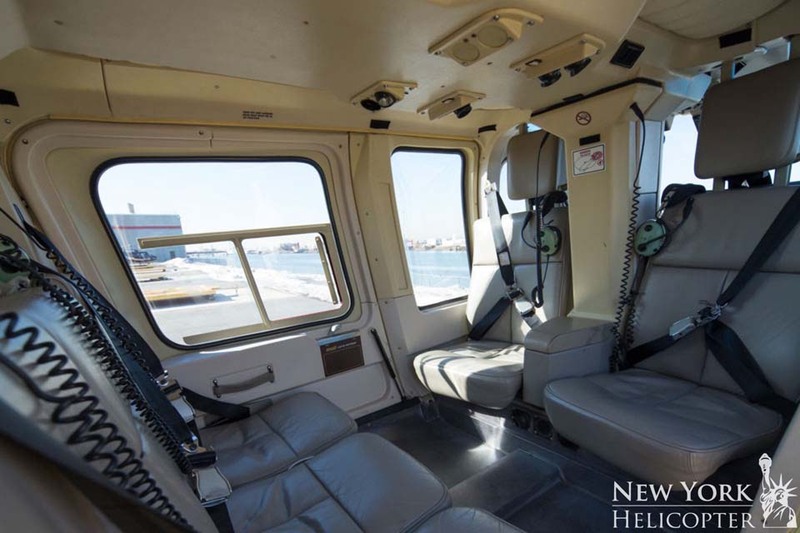 What does the interior of your helicopter look like? What if there is bad weather on the day of my tour? Is there public transportation to the Downtown Heliport? Is there parking available at the Downtown Heliport? Please view our New York Helicopter Tours pricing information. Tour schedules and prices are subject to change. Helicopter passengers weighing more than 250 lbs. are required to purchase an adjacent empty seat to safely balance the aircraft. As per agreement with City Hall, all tour helicopter companies are restricted to flying over water. Prohibiting these flights has adjusted all tourism flight paths to along the water. Any child under 24 months of age is welcome to ride as a lap child at no charge. Children 24 months and over require an individual full-fare seat. *There is a $30 heliport fee per person that still applies to children under 2 years old. Yes, there is an additional heliport facility/security fee of $35.00 per person that is added onto the price of the tour. Also, there is a $2.00 locker fee that may apply if you have any materials that are not allowed onboard our aircrafts. Yes! Helicopters are among the safest transportation modes available, and are the most widely used air rescue vehicles in the world. We fly the Bell Jet Ranger that is statistically the safest aircraft ever built. Trust us, spend one day on one of our helicopters and you’ll never want to travel any other way! Our helicopters seat either 4 or 6 passengers plus 1 pilot. Yes, you need to make a reservation in advance. Book your New York City helicopter tour online or call us at 212-361-6060. If New York Helicopter cancels tours due to bad weather then you can reschedule your tour for another day or cancel. Please call us at 212-361-6060 if you have questions and we can help you out. Please make sure to bring your photo I.D. and credit/debit card used to book your reservation. You may not bring purses or backpacks into the helicopter, but will be allowed to store them in a locker for a $2.00 fee. Only items allowed onboard the aircraft are handheld cameras, phones, ipads, sunglasses and small wallets. Don’t forget to bring your camera to capture all of the great views! Directions: If you are coming to the Heliport by Subway please take the (R) or (1) trains to Whitehall Street / South Street Ferry, or the #4 or #5 train to Bowling Green. To get here by Bus you can take either the M1, M6, or M15 to South Street Ferry. No, there is not parking at the Heliport but there are public parking lots nearby. To cancel for a full refund you must cancel 48 hours in advance in a written email to info@newyorkhelicopter.com. Refunds can take up to 30 days to be processed. Feel free to give us a call at (212) 361-6060 if you do, we’d be happy to assist you.